^ a b c Mead, J.G. ; Brownell, R. L. Jr. (2005). "Order Cetacea". In Wilson, D.E. ; Reeder, D.M (eds.). Mammal Species of the World: A Taxonomic and Geographic Reference (3rd ed.). Johns Hopkins University Press. p. 725. ISBN 978-0-8018-8221-0. OCLC 62265494. 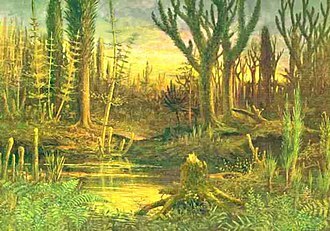 ^ "Fossilworks Dataway". 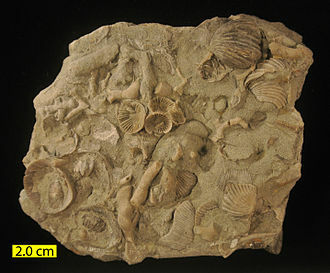 Fossilworks Gateway to Paleontology. Retrieved 20 April 2018. ^ a b c Lockyer, C. (1978). "Growth and Energy Budgets of Large Baleen Whales from the Southern Hemisphere". In Food and Agriculture Organization of the United Nations. Working Party on Marine Mammals (ed.). Mammals in the Seas: General papers and large cetaceans. Food & Agriculture Org. pp. 503–. ISBN 978-92-5-100513-2. ^ Yochem PK, Leatherwood S (1980). 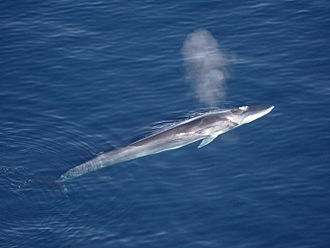 "Blue whale Balaenoptera musculus (Linnaeus, 1758)". In Ridgway SH, Harrison R (eds.). Handbook of Marine Mammals, Vol. 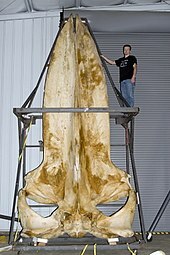 3:The Sirenians and Baleen Whales. London: Academic Press. pp. 193–240. ^ "Huge beached blue whale saved by fishermen off Chile coast". 30 December 2015. ^ Cummings, William C.; Thompson, Paul O. (1 October 1971). "Underwater Sounds from the Blue Whale, Balaenoptera musculus". The Journal of the Acoustical Society of America. 50 (4B): 1193–1198. Bibcode:1971ASAJ...50.1193C. doi:10.1121/1.1912752. ISSN 0001-4966. ^ a b Korteniemi, Jarmo (13 March 2018). "Suomalaisen sinivalaan tarina". www.tiedetuubi.fi (in Finnish). Retrieved 14 March 2018. ^ "Jättiläisen jäljillä". Tiede (in Finnish). 8 February 2011. Retrieved 14 March 2018. ^ "Global whale hot spot discovered off East Timor". Reuters. 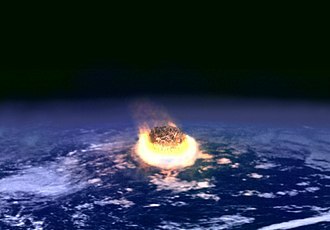 31 December 2008. ^ "Sciency Thoughts: Satellite tracking Pygmy Blue Whales". 12 April 2014. ^ "Maharashtra: Blue whales spotted off Sindhudurg coast after 100yrs". hindustantimes.com. 20 May 2015. ^ "Dead blue whale, fetus wash ashore in San Mateo County". The Mercury News. 6 October 2010. Retrieved 14 March 2018. ^ Rogers, Paul (27 May 2017). "Blue whale washes up dead along Northern California beach". Santa Cruz Sentinel. Retrieved 14 March 2018. ^ Goldbogen JA, Southall BL, Deruiter SL, Calambokidis J, Friedlaender AS, Hazen EL, Falcone EA, Schorr GS, Douglas A, Moretti DJ, Kyburg C, McKenna MF, Tyack PL (3 July 2013). "Blue whales respond to simulated mid-frequency military sonar". Proceedings of the Royal Society B. 280 (765): 20130657. doi:10.1098/rspb.2013.0657. PMC 3712439. PMID 23825206. Marine mammals are aquatic mammals that rely on the ocean and other marine ecosystems for their existence. They include animals such as seals, manatees, sea otters and they do not represent a distinct taxon or systematic grouping, but rather have a polyphyletic relation due to convergent evolution. They are unified by their reliance on the environment for feeding. Marine mammal adaptation to an aquatic lifestyle vary considerably between species, both cetaceans and sirenians are fully aquatic and therefore are obligate water dwellers. Seals and sea-lions are semiaquatic, they spend the majority of their time in the water, in contrast, both otters and the polar bear are much less adapted to aquatic living. Their diet varies considerably as well, some may eat zooplankton, others may eat fish, shellfish, sea-grass and this role in maintaining ecosystems makes them of particular concern as 23% of marine mammal species are currently threatened. 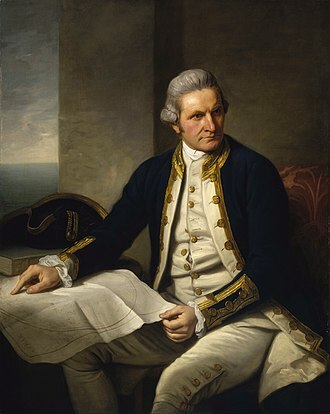 Marine mammals were first hunted by aboriginal peoples for food and other resources, many were the target for commercial industry, leading to a sharp decline in all populations of exploited species, such as whales and seals. Commercial hunting lead to the extinction of †Stellers sea cow and the monk seal. Other than hunting, marine mammals can be killed as bycatch from fisheries, increased ocean traffic causes collisions between fast ocean vessels and large marine mammals. Habitat degradation threatens marine mammals and their ability to find, noise pollution, for example, may adversely affect echolocating mammals, and the ongoing effects of global warming degrade arctic environments. Marine mammals form a group of 129 species that rely on the ocean for their existence. 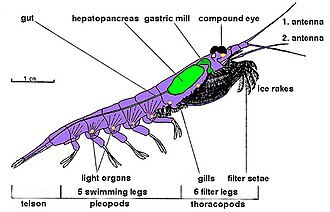 They do not represent a taxon or systematic grouping. They are unified by their reliance on the environment for feeding. The level of dependence on the environment for existence varies considerably with species. For example and whales are completely dependent on the environment for all stages of their life, seals feed in the ocean but breed on land. 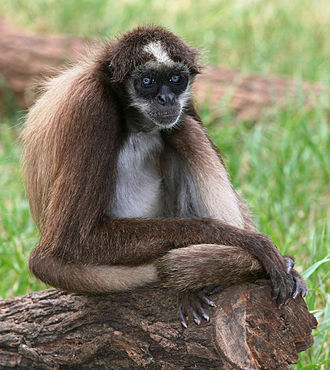 Twenty three percent of mammal species are threatened. Five of these lineages are extinct, despite the diversity in morphology seen between groups, improving foraging efficiency has been the main driver in the evolution in these lineages. The evolutionary history of cetaceans is thought to have occurred in the Indian subcontinent from even-toed ungulates 50 million years ago, over a period of at least 15 million years. Cetaceans are fully aquatic marine mammals belonging to the order Artiodactyla, cetaceans are thought to have evolved during the Eocene or earlier, sharing a closest common ancestor with hippopotamuses. Discoveries starting in the late 1970s in Pakistan revealed several stages in the transition of cetaceans from land to sea, the adaptation of echolocation in toothed whales distinguishes them from fully aquatic archaeocetes and early baleen whales. The presence of baleen in baleen whales occurred gradually, with earlier varieties having very little baleen, modern-day cetacean evolution is largely affected by local culture and social network. Tool-use for foraging in certain societies affects the diet, and allows them to more varieties of food. This behavior is passed down from mother-to-child, as in the bottlenose dolphins residing in Shark Bay, social bonds between dolphins in a pod can affect overall fitness in a habitat, decreasing or increasing the survival chances for any particular individual in that pod. 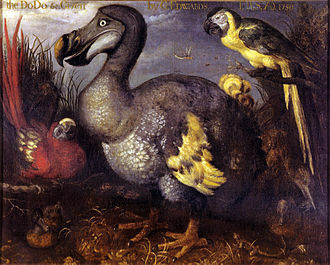 Social bonds between different species can sometimes cause interbreeding, archaeoceti is an extinct parvorder of Cetacea containing ancient whales. 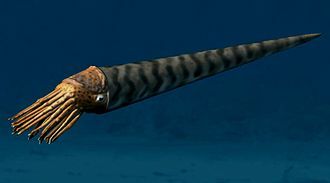 This theory arose due to similarities between the triangular teeth of the mesonychids and those of early whales. However, molecular data indicates that whales are very closely related to the artiodactyls. 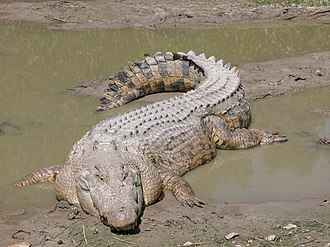 Because of this and hippopotamuses are placed in the same suborder, cetartiodactyla is a proposed name for an order containing both cetaceans and artiodactyls. 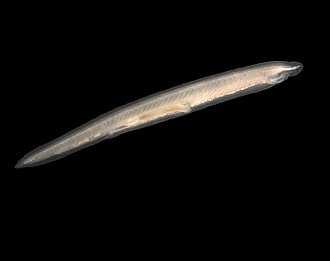 Since molecular analysis identifies artiodactyls as being closely related to cetaceans, mesonychids are probably an offshoot from Artiodactyla. 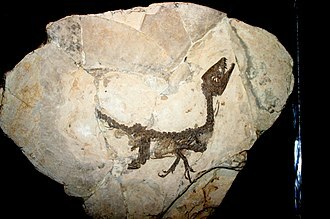 The molecular data is supported by the discovery of Pakicetus, the earliest archaeocete, the skeletons of Pakicetus show that whales did not derive directly from mesonychids. 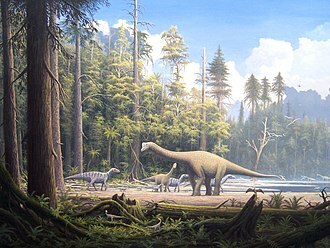 Instead, they are artiodactyls that began to take to the soon after artiodactyls split from mesonychids. 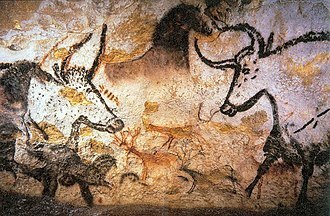 Archaeocetes retained aspects of their ancestry which modern artiodactyls. Rorquals /ˈrɔːrkwəl/ are the largest group of baleen whales, a family with nine extant species in two genera. Rorquals take their name from French rorqual, which derives from the Norwegian word røyrkval, all members of the family have a series of longitudinal folds of skin running from below the mouth back to the navel. 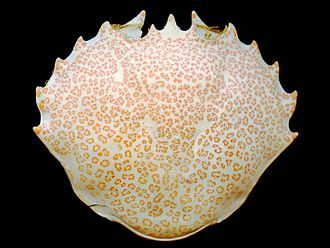 These are understood to allow the mouth to expand immensely when feeding, permitting them to engorge great mouthfuls of food and these pleated throat grooves distinguish balaenopterids from other whales. 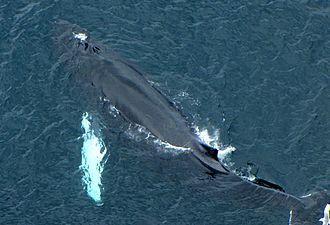 Rorquals are slender and streamlined in shape, compared with their relatives the right whales and they have a dorsal fin, situated about two-thirds the way back. Rorquals feed by gulping in water, and pushing it out through the plates with their tongue. 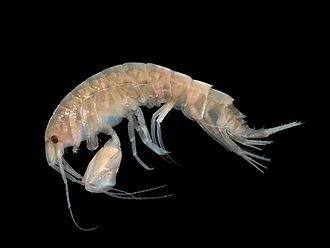 They feed on crustaceans, such as krill, but on various fish, such as herrings, gestation in rorquals lasts 11–12 months, so that both mating and birthing occur at the same time of year. Cows give birth to a calf, which is weaned after 6–12 months. 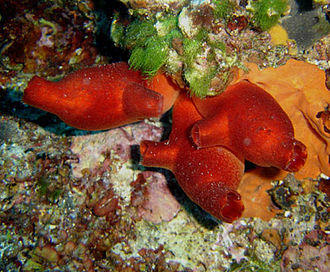 Of some species, adults live in groups, or pods of two to five individuals. 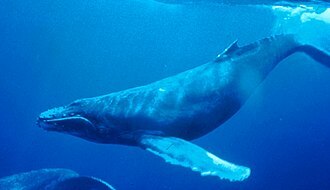 For example, humpback whales have a social structure, often engaging behavioral practices in a pod. 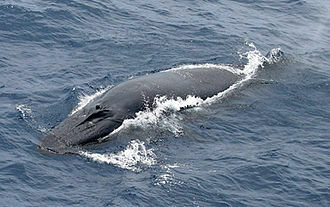 The minke whale is named after a Norwegian whaler named Meincke. 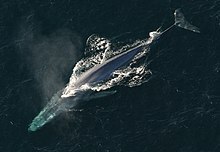 Most rorquals are strictly oceanic, the exceptions are Brydes whale and Edens whale, within each species, the largest individuals tend to approach the poles more closely, while the youngest and fittest ones tend to stay in warmer waters before leaving on their annual migration. Most rorquals breed in tropical waters during the winter, back to the polar feeding grounds rich in plankton. As well as methods, rorqual whales obtain prey by lunge feeding on bait balls. 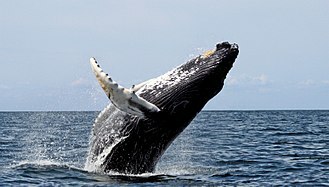 Lunge feeding is a feeding method, where the whale accelerates to a high velocity. This generates the water required to expand its mouth and engulf and filter a huge amount of water. Furthermore, their large nerves are flexible so that they can stretch, in fact, they give rorquals the ability to open their mouths so wide that they would be capable of taking in water at volumes greater than their own sizes. A whaler or whaling ship is a specialized ship, designed for whaling, the catching and/or processing of whales. The former includes the whale catcher – a steam or diesel-driven vessel with a gun mounted at its bow. The latter includes such vessels as the sail or steam-driven whaleship of the 16th to early 20th century, there have been vessels which combined the two activities, such as the bottlenose whalers of the late 19th and early 20th century, and catcher/factory ships of the modern era. Whaleships had two or more whaleboats, open rowing boats used in the capture of whales, whaleboats brought the captured whales to the whaleships to be flensed or cut up. 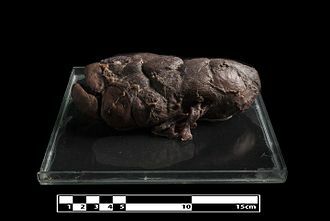 Here the blubber was rendered into oil using two or three set in a brick furnace called the tryworks. At first, whale catchers either brought the whales they killed to a station or factory ship anchored in a sheltered bay or inlet. Later, with the development of the slipway at the ships stern, the World War II Flower-class corvettes were based on the design of the whale catcher Southern Pride. The crews of whaling vessels fought small skirmishes for the control of the Spitsbergen whale fishery between 1613 and 1638. In the late 18th and early 19th century the owners of whalerships frequently armed their vessels with cannons to enable the vessels to protect themselves against pirates, and in wartime, privateers. At the outbreak of the French Revolutionary Wars in 1793, British privateers captured several French whaleships, among them Necker and Deux Amis, dutch privateers captured Port de Paix and Penn. At the time, many French whaleships transferred to the American flag, some whaleships carried letters of marque that authorized them to take enemy vessels should the opportunity arise. In July 1793 the British armed whaleship Liverpool, of 20 guns, Chardons crew succeeded in retaking their vessel. 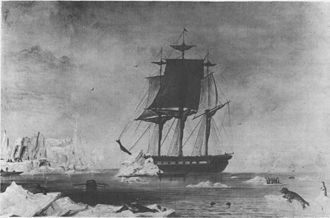 In 1793, an armed British whaleship captured the French whaleship Hébé in Walvis Bay, during the War of 1812, the U. S. Navy captured two whaleships, Essex Junior and Seringapatam, and used them as warships. Cetacea are a widely distributed and diverse clade of aquatic mammals that today consists of the whales and porpoises. 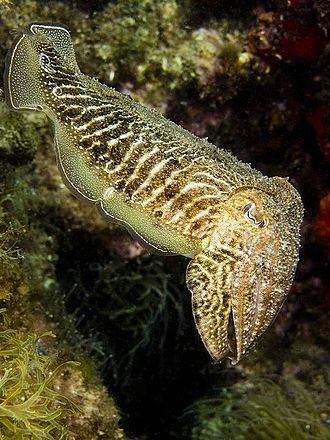 Most species live in the sea, some in rivers, the name is derived from the Latin cetus whale and Greek ketos huge fish. 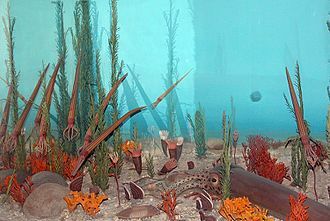 The extinct ancestors of modern whales are the Archaeoceti, while cetaceans were historically thought to have descended from mesonychids, molecular evidence supports them as a relative of Artiodactyls. Cetaceans belong to the order Cetartiodactyla and their closest living relatives are hippopotamuses and other hoofed mammals, having diverged about 50 million years ago. 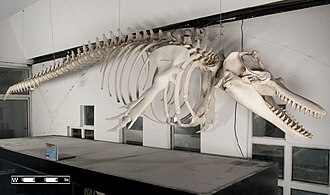 Cetaceans range in size from the 1 m and 50 kg Mauis dolphin to the 29.9 m and 190,000 kg blue whale and they have streamlined bodies and two limbs that are modified into flippers. Dolphins are able to very tight turns while swimming at high speeds. The hindlimbs of cetaceans are internal, and are thought to be vestigial, baleen whales have short hairs on their mouth, unlike the toothed whales. Cetaceans have well-developed senses—their eyesight and hearing are adapted for both air and water, and baleen whales have a system in their vibrissae. 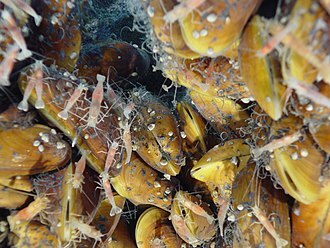 They have a layer of fat, or blubber, under the skin to maintain body heat in cold water, Some species are well adapted for diving to great depths. Although cetaceans are widespread, most species prefer the waters of the Northern and Southern Hemispheres. 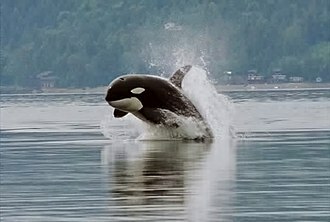 They spend their lives in the water, having to mate, give birth, molt or escape predators, like killer whales. This has drastically affected their anatomy to be able to do so and they feed largely on fish and marine invertebrates, but a few, like the killer whale, feed on large mammals and birds, such as penguins and seals. 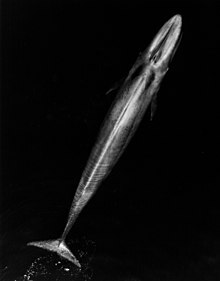 Some baleen whales are specialised for feeding on benthic creatures, male cetaceans typically mate with more than one female, although the degree of polygyny varies with the species. Cetaceans are not shown to have pair bonds, male cetacean strategies for reproductive success vary between herding females, defending potential mates from other males, or whale song which attracts mates.